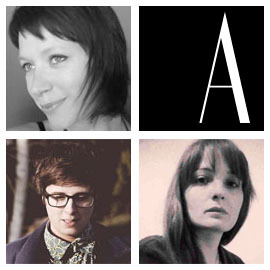 All three beautiful pamphlets in Annexe Magazine’s ‘Introducing’ series are very small (A6) and very short (12 pages). 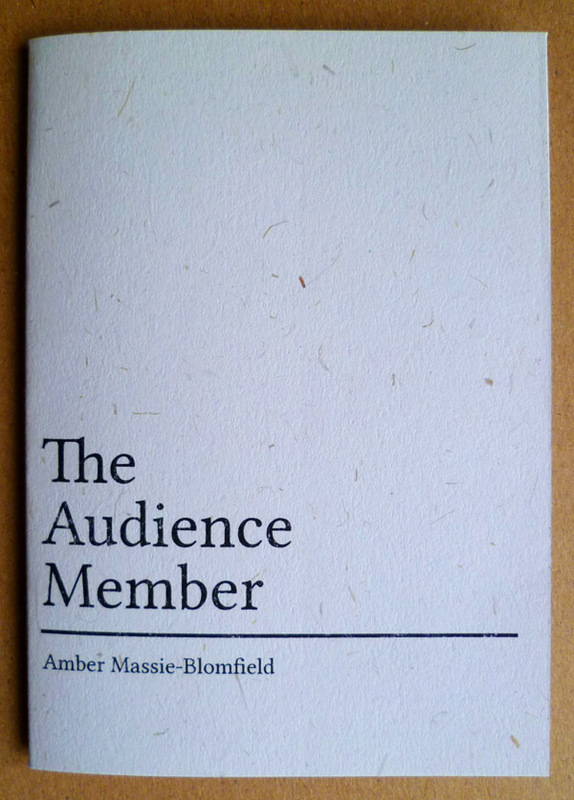 They are: The Audience Member by Amber Massie-Blomfield, which is short fiction; Selected Poems by Charlotte Newman and The Histories by Michael C. Schuller, which are poetry. Like many short stories, The Audience Member is essentially the dramatisation of a single image: a man, the sole audience member of a “one woman show”, wildly applauding the end “like an embarrassing dad at a school concert”. The day of the play is in the present tense, with the rest as past tense narrative of how he came to be there, of how this moment has come to mean so much, all starting with his secretary’s suggestion of going to the theatre on the first page. In doing so, in aiming at this climactic moment, Massie-Blomfield has two related challenges: to dramatise this back story effectively, and to do so concisely but without squashing the characters into subservience to the plot. The characterisation is mostly effective. The main figure, John, is driven by inordinate emotional stress, and stress which the reader can’t (and shouldn’t) ever be able to appreciate, which means that he, and the narrator’s closeness to him, must be dealt with carefully. Sometimes the moments of closest free indirect discourse can seem a little improbable and less meaningful; in his minor breakdown before his first theatre visit, “he was standing in the middle of the empty kitchen, and he found that he was unable to move” is much more affecting than “This wouldn’t do. He wasn’t the kind of man that cried.” Otherwise, John grows through the pamphlet, especially so when it moves into the present tense; something about the present tense in sentences like “But he’s learning to be alone with his thoughts” is very powerful. The ‘supporting cast’, on the other hand, is a little less successful. The secretary, whose role in the plot is functional, could’ve done with some hints of a life beyond John’s. Otherwise, we’ve the crucial characters of John’s wife and son, who are present only in his recollections, which brings us to the back story. “Thank you so much for coming,” she says. Ours is a charnel house, yours is a wreck. 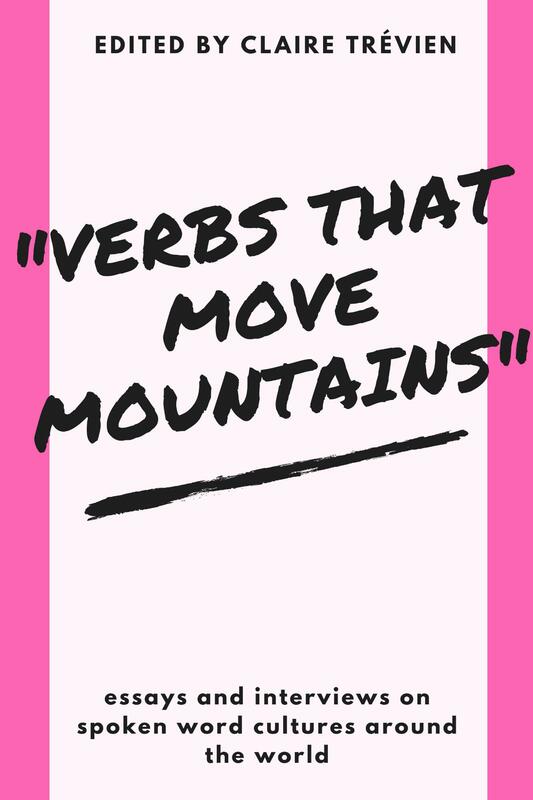 The anchors for poetry such as this are the pronouns and the characters they imply, as the rest serves as the emotional reality of their relations. There is, in this regard, always the sense that something is at stake. The terror is in working out what it is. The first apparent feature of the pamphlet is the tight patterns of sound. In the example above there’s: the rhyme in “wreck … circumspect”; the repetition in “wreck … rig … ripcord … rock … reward”, enhanced by the rhyme on “ripcord … reward”; and the accelerating series of Ts in the final lines. Newman returns to sounds obsessively; she frequently rhymes the last word of a line with the first of the next, as if impatient to return. These (often trochaic) patterns are closed up and bumped, as if a drawstring through them has been pulled tight, which increases the tempo, turns the contrast up, and makes us more aware of the words as words and more aware of the process of reading. It is language referring insistently to itself. the mark of a thrifty maker. ‘Beach’ in particular becomes a tissue of altered quotations and puns, and includes a passage of virtuose playing on the names of fonts. It makes clear that, for everything we wish to say, we are using other people’s words to say them. There is a sense of complete freedom with her allusions, her half-formed parodies and sudden changes in register. The poems come at you from everything you’ve ever read. 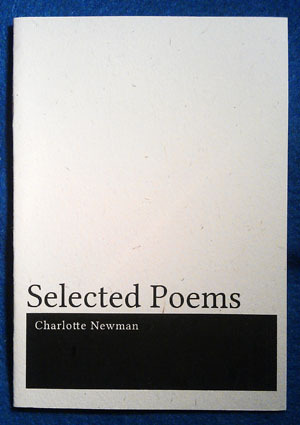 Like a howl of feedback, the stronger poems in this pamphlet create themselves entirely and solely out of the features which cause difficulty and are limitless as a result. The best of these then interrogate an idea through its own terms, and turn the process of reading back onto itself. It’s impossible to read Selected Poems without having to be a critic too. But the art form, and these poems, is worth the effort. Both Selected Poems and The Histories are, we are told, parts of a larger work, which I think is what all literature is and should feel like. The city comes and goes underfoot. the ones that used to be familiar. the way a song might make you remember. Now it is just pavement, concrete, stones, and lines of paint. heard all the stories of her rising and her course. From the air, at night, all cities are an array of light. most look like burning spill on black water. and they go on without you. of places I will never go again? Whole cities of flats, streets, shops. It is hard to know what the poems of The Histories are reaching for. At their worst, these poems are like bad jazz, in that they seem to be more for the performer than the audience, and their self-proclaimed seriousness is not enough to persuade otherwise. At their best, they remember to withhold things from the reader (which is generous, not selfish) and to challenge, but this is regrettably seldom. 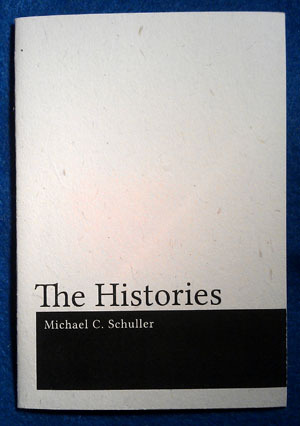 The Histories contains the sort of sober and reflective poems that are always going to be shouted over by those of Charlotte Newman, but it’s hard to shake the suspicion that contemporary poetics have rendered Michael C Schuller’s style of poetry redundant.